Website Monitoring Software check the status and performance of websites in real time. Software easily monitors the uptime, downtime and ping status of web based application supporting with different type of Internet services including HTTP, HTTPS, SMTP, POP3 and FTP server protocols. 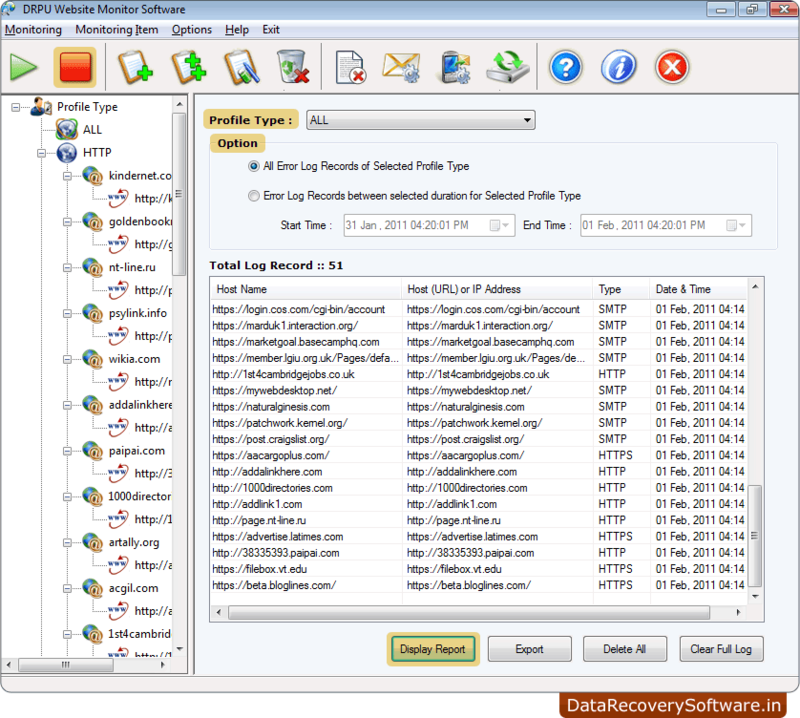 If any website or web based application goes down or cannot be accessed due to server errors including Host not Found, Server Not Found, Connection Failed, Page cannot be displayed, Low Bandwidth, Low Connectivity, Network Status, etc then Web monitoring tool informs you by sending alert notification such as sending email or beeps a sound or runs a specific program. Website Monitoring tool checks the performance of websites in real time. 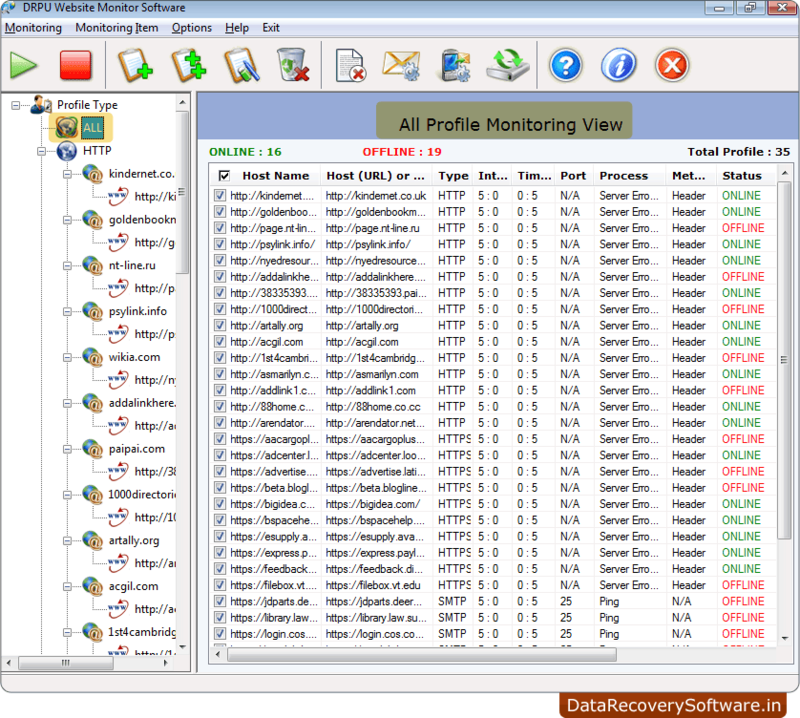 Software monitors uptime, down time and ping status of web applications. Sends immediate alert notification by sending mail, beep sounds or runs a specific program when your website is down or becomes inaccessible. Supports different types of internet services including HTTP, HTTPS, POP3, SMTP and FTP server protocols. Website analyzer protects website even from various errors such as Host not Found, Server Not Found, Connection Failed, Low Connectivity Network Status etc. Here, Wizard shows 'All Profile Monitoring View' to check online and offline status of websites. You can also add, open and close profiles as per requirements. 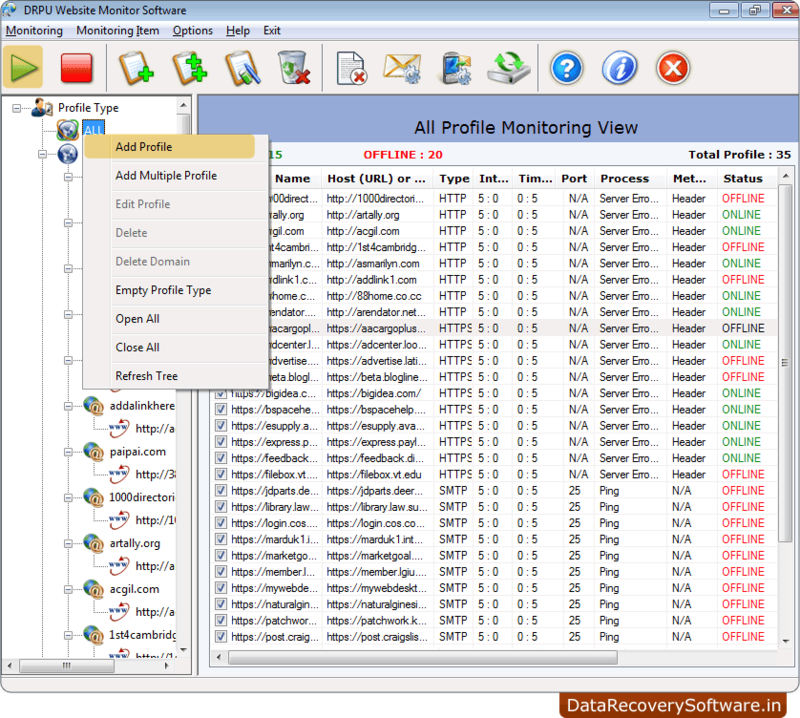 Select Profile type and choose any one option either 'All Error Log Records of Selected Profile Type' or 'Error Log Records between selected duration for Selected Profile Type'. Click on 'Display Report' button to view monitoring log report.